Galion's Allison DeNero in action during Wednesday's dual-meet with the Lady Eagles of Colonel Crawford at the Galion YMCA. 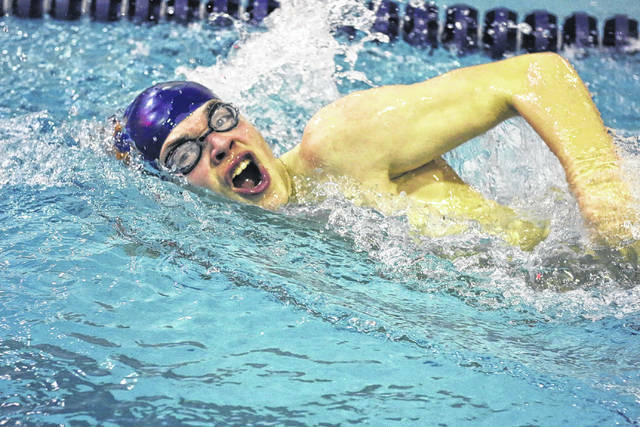 Drew Owens makes a splash on Wednesday at the Galion YMCA. The Tigers welcomed the Colonel Crawford Eagles to town and came away with the 73-21 victory. 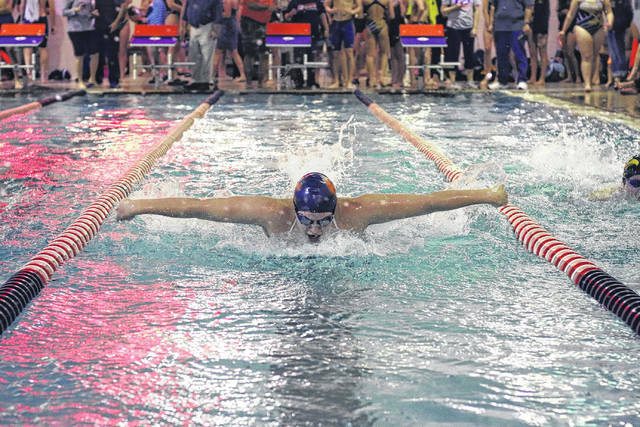 GALION — The Galion YMCA played host to two swimming teams with a history of strong programs on the afternoon of Wednesday, December 6. Galion welcomed Colonel Crawford the the Y for a dual-meet and would split the day with the visiting Eagles. The Tigers boys team won easily over Crawford; 73-21. Crawford’s girls squad would return that favor by sweeping every first place finish en route to a 79-14 victory. On the boys side, the hosting Tigers took first in all but one event as the Eagles Nic Motter earned the top spot in the 200-yard individual medley with a time of 2:13.55. Galion’s Sam Rigdon and Luke Eisnaugle would finish second and third, respectively. Alec Dicus and Caleb Strack both earned a pair of individual wins on the afternoon. Dicus swam to first in the 200-yard freestyle (1:58.12) and the 500-free (5:21.99). For Strack, it was a win in the 50-free (24.15) and the 100-yard backstroke (59.01). Also earning individual wins for the Tigers were: Clay Karnes- 100-yard butterfly, 59.81; Weston Rose- 100-free, 55.26 and Eisnaugle- 100-yard breaststroke, 1:08.21. Over in the relay events, the home team would take first and runner-up honors in all three races. The 200-yard medley relay team of Strack, Eisnaugle, Karnes and Rigdon swam their race in 1:50.53 for the victory. Galion’s second team of Ben Alstadt, Braxton Tate, Chris Amick and Isaac Niedermier were the runner-up. Alstadt, Eisnaugle, Karnes and Rigdon (1:40.40) outlasted the foursome of Rose, Niedermier, Amick and Dicus in the 200-free relay. In the final race of the day, the 400-free relay, the group of Alstadt, Rose, Dicus and Strack (3:51.38) defeated the other Tigers squad of Niedermier, Amick, Wyatt Enders and Tate (4:19.97). Jayden Ward, Cassidy Vogt and Kaisey Speck all finished with a pair of individual wins for the Lady Eagles on Wednesday. Ward snagged first in the 200-free (2:10.81) and the 500-free (5:56.62). Vogt earned first in the 100-fly (1:05.44) and the 100-back (1:12.03). Speck swam to first in the 200-IM (2:25.24) and also in the 100-fly (1:05.44). Jillianne Gregg and Drew Krassow were also individual event winners with Gregg winning the 50-free (25.88) and Krassow the 100-breast (1:15.78). Much like the Galion boys team, the Lady Eagles took both first and second place in the three relay races. The group of Vogt, D. Krassow, Gregg and Pierce Krassow earned the win in the 200-medly relay with a time of 1:59.99. Over in the 200-free relay race, it was Gregg, Hailey Ratliff, Speck and P. Krassow with the win in 1:51.10. In the 400-free relay, Crawford completed their sweep of the meet when the foursome of Speck, Gregg, Ward and Vogt won the event in a time of 4:16.12. The Galion squads will be on the road on Saturday, December 9 to compete in the Sandusky Invite and the Eagles teams will be at Fremont Ross High School to participate in the DHL-Northwest Ohio Classic. Galion’s Allison DeNero in action during Wednesday’s dual-meet with the Lady Eagles of Colonel Crawford at the Galion YMCA. https://www.galioninquirer.com/wp-content/uploads/sites/38/2017/12/web1_IMG_6455.jpgGalion’s Allison DeNero in action during Wednesday’s dual-meet with the Lady Eagles of Colonel Crawford at the Galion YMCA. https://www.galioninquirer.com/wp-content/uploads/sites/38/2017/12/web1_IMG_6491.jpgDrew Owens makes a splash on Wednesday at the Galion YMCA. The Tigers welcomed the Colonel Crawford Eagles to town and came away with the 73-21 victory.